Pura vida (POO-rah VEE-dah), in English means the “Pure Life.” No two words better describe the lifestyle and experience that you will gain while embarking on your Costa Rican excursion. Join us as we explore a country of exceptional beauty and diversity. In just over a week we will explore the foothills of a volcano, fly amongst monkeys in the cloud forests and scale alongside cascading waterfalls. Our journey will begin in La Fortuna where we will learn about sustainable agriculture, craft organically made chocolate and venture throughout a nearby cave system. 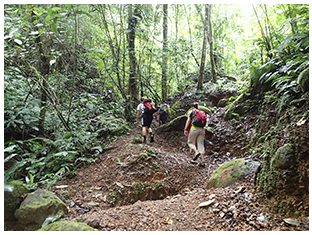 We then embark to Monteverde where we will experience the one of-a- kind cloud forest on foot and through the air on a high flying zip-line! Keep an eye out for toucans, sloths and the famous Quetzal! Travel south to Manuel Antonio. Here we will discover a much different habitat as we explore the Pacific Ocean and jungle lined coasts. The following day will be spent on a grand adventure paddling down the world class rapids of the Savegre River. Along the way you will witness how life flourishes along the river banks and how the river has carved through the canyons for thousands of years. Finish the trip off the beaten path as we hike to a hidden location where we will be rappelling down a set of waterfalls. Cool off in the pristine swimming holes before our evening camping in a tucked away cave directly behind the waterfalls. Our last will be spent with in the highest elevations of Costa Rica with a local family. From milking cows to warming up next to their ecologically powered fireplace, this is sure to be an unforgettable last night! occasions with a few activities that require strenuous up-hill hiking, spelunking, swimming and good sense of adventure! Feel free to contact us with any questions or concerns. Prices are subject to change based on departure dates, airfare changes and the number of participants.